Obviously there's my favorite duo - The Schmidtlets. Then there's my pair of puggles. And now I'm adding a new two to the list: A SECOND BOOK DEAL! I’m thrilled to share that my second book - Bright Before Sunrise - will be published by Walker-Bloomsbury in winter 2014! When Jonah is forced to move from Hamilton to Cross Pointe for the second half of his senior year, "miserable" doesn't even begin to cover it. He feels like the doggy-bag from his mother's first marriage; and everything else about her new life—with a new husband, new home and a new baby—is an upgrade. The people at Cross Pointe High School are pretentious and privileged—and worst of all is Brighton Waterford, the embodiment of all things superficial and popular. Jonah’s girlfriend, Carly, is his last tie to what feels real... until she breaks up with him. ...if only Twinkies weren't gross. That's fantastic news - congrats Tiffany! The book sounds great. Congrats, Tiffany!!! It sounds amazing. Why is 2014 so far away?? Also, how do you live in the midst of such adorableness? I mean, add you and St Matt to the mix and your household is on serious overload. And Ho-Hos come in packs of 2. Total win. So happy for you! Well deserved. Thanks, Trisha! My life is full of cute & chaos. And hopefully patience because 2014 seems FAR! Double congratulations, Tiffany!! I cannot wait to read BRIGHT BEFORE SUNRISE!! And OMG, those little Schmidtlet baby toes are adorable!!!!! *bounces* YAY! How about a pack of Reese's cups? That's a 2 pack! Ha! I totally put a bottle of Prosecco in the fridge... and totally forgot about it. Yay, Tiffany!!! That's very, very (two!) exciting! I think you just need to bake--twice--to celebrate!!! "One night can change how you see the world. One night can change how you see yourself." Congratulations, Tiffany! This whole post is so upbeat and inspiring. Great way to start the day! Thanks for sharing, and for the great photos. Lovely lovely news, Tiffany! And how big those Schmidtlets are getting! Thanks, Anne! And, seriously! Who gave them permission to grow up so quickly? Where's the pause button on babies? Tiffany, also late to the party, but just saw this on the Apocalypsies board. Congratulations!!! BRIGHT BEFORE SUNRISE sounds wonderful. 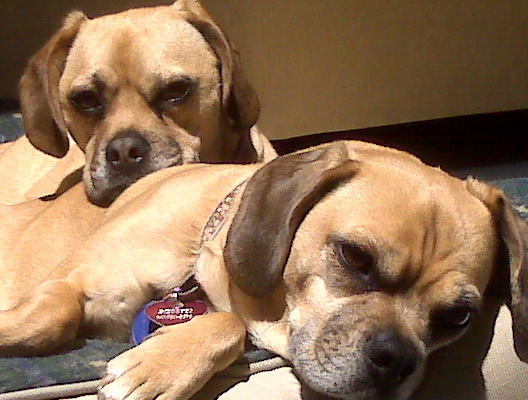 And that picture of your boys and puggles is ridiculously full of cute. Congratulations, Tiffany! Your latest book sounds amazing :) I also think that pic of your babies (two and four legged!) cuddling on the couch is maybe one of the cutest I'v seen :) Lots to celebrate! Congratulations! That's great news. Just added it on Goodreads. Adorable pictures!